Mix spinach, garlic, green onions, cream cheese, and monterey jack cheese in large bowl. Place approximately 3 tbsp of spinach mixture into the center of each tortilla and roll them up. Place filled tortillas side by side seam side down in casserole dish. Meanwhile mix enchilada sauce and sour cream in small saucepan simmer over low to medium heat stirring frequently. Cover with Shredded Pepper Jack cheese and return to oven until cheese is melted and bubbly. 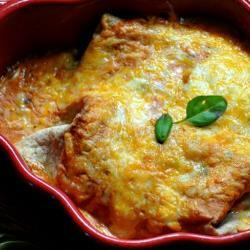 Remove enchiladas from oven and cover with sauce mixture serve immediately.